A weekly newspaper secured free Premier League football tickets for a junior team who had cash set aside for the trip stolen by their coach. Players for Chartham Sports under-9s football team in Canterbury, Kent, had their dreams of watching Tottenham Hotspur dashed when coach Clinton Hunter stole £2,520 forked up by parents to pay for the outing. But after the Kentish Gazette intervened and contacted Spurs, the London club offered the team 50 free tickets to their match against Cardiff City next month. The Gazette also contacted rail firm Southeastern, which has thrown in free train travel to make sure the youngsters reach the home of football in good time. 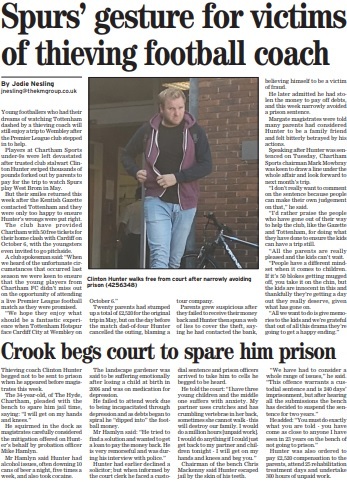 Chartham Sports was told of the gestures as Hunter narrowly avoided prison this week after earlier admitting the thefts. Speaking after the hearing, club chairman Mark Mowbray told the Gazette: “I don’t really want to comment on the sentence because people can make their own judgement on that. I’d rather praise the people who have gone out of their way to help the club, like the Kentish Gazette, Tottenham and Southeastern, for doing what they have done to ensure the kids can still have a trip. “All the parents are really pleased and the kids can’t wait. People have a different mindset when it comes to children. If it’s 50 blokes getting mugged off, you take it on the chin, but the kids are innocent in this and thankfully they’re getting a day out they really deserve, given what has gone on. Gazette editor Joe Walker said: “When we first learned of Clinton Hunter’s disgraceful actions, we couldn’t help but feel for the children who had been let down the day before such an exciting trip. “We contacted Tottenham to see if they could help, and they’ve managed to pull the strings to get everyone along to a game, and even go pitchside at Wembley. The fact Southeastern was willing to chip in to cover the travel means parents haven’t been left out of pocket at all. “… when coach Clinton Hunter stole £2,520 forked up by parents to pay for the outing.” Forked up?